When you getting tired of visiting, walking and eating at the Tsukiji Market, let’s go to the “Sentō”. Sentō is used to be a public bathhouse for people who did not have a bath at home. There are many sentō which has long time loved by the people around Tsukiji. We’ll show you 5 selected sentō you can visit by walking from the Tsukiji market. Take a bath and relax! At the entrance of the building you see a remarkable triangle and a letterゆ(Yu). Though their bathroom is located underground, it’s bright and spaciousness feeling. Your first impression is comfortable. You can buy soap, shampoo and towels here. So you can easily enjoy typical Japanese traditional sentō as a part of sightseeing without bring anything. In the bathroom you see a tiled floor and wall. 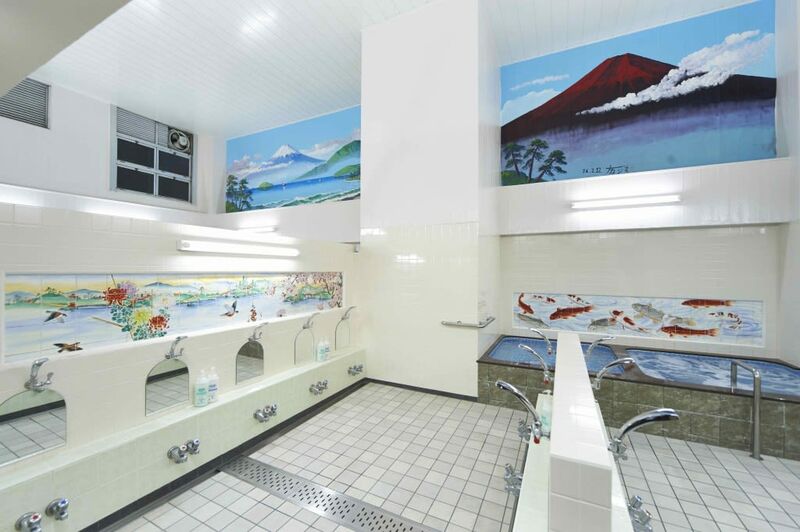 Especially besides the walls of the bathtub, you find beautiful Ukiyoe. You may be surprised of the hot water temperature in the bathtub. Because of fashionable outside, it doesn’t look like a sentō at “Minato Yu”. Unified with a modern setting of the lobby, changing rooms and the bathroom interior. You can enjoy three different types of bathtub using a gentle soft water which is good for your skin, a cold bath and a sauna. You have to pay extra when you want to use the sauna. So you should ask at front desk before using it. They have two different types of bathroom. It changes week by week: one week for women, the next week for men. If you have enough time, you should go there many times and enjoy the differences. “Ginza Yu” is located near the middle of the city, Ginza 1-chome. It consists out of 2 floors. At the first floor, take off your shoes and put them in the shoe locker. They also have larger lockers which can fit boots. Pay the bathing fee at the front desk. At the second floor, there are changing rooms where you take off all your clothes and bathrooms. At the bathroom, you see washing space and two types of bathtub. One is standard and another is Jacuzzi type. There is no cold bath. 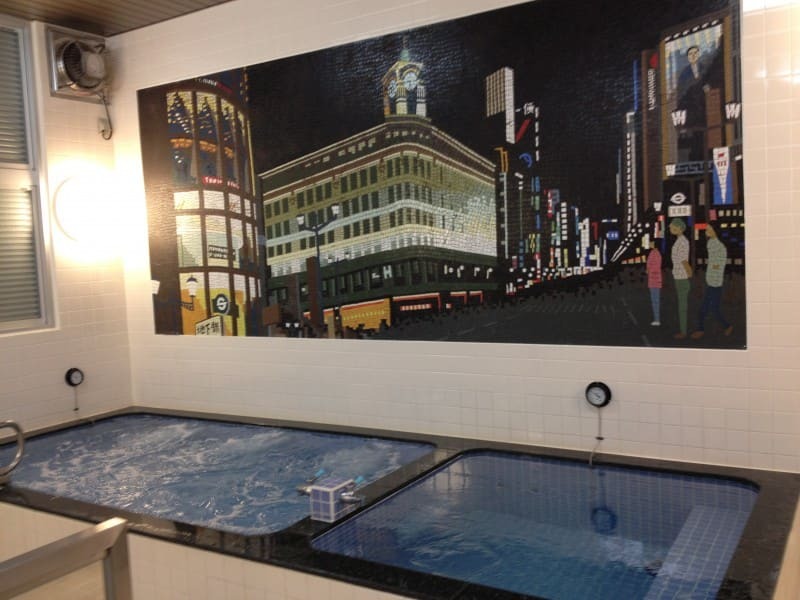 At the wall of the bathroom, you see mosaics made out of tiles which shows intersection landscape of Ginza at night. “Konparu Yu” is a traditional sentō . It’s opened since the Edo Period. This sentō is located on back street of Ginza-chūō-dori which is one of popular streets in Tokyo. 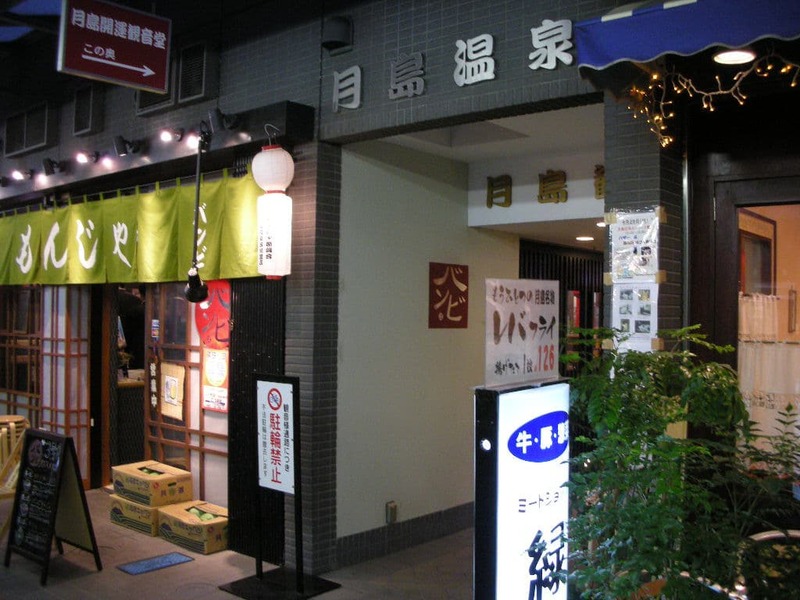 Near this sentō , there are many exclusive restaurants. Konparu Yu is one of the valuable sentō at Ginza, just like another sentō ”Ginza Yu”. On the entrance you see the plate “わ (wa)”. It means boiling water, in other words open. There are two bathtubs and washing space. You see traditional painting of Mt. Fuji on the wall and gold fish on the Kutani yaki tiles. ”Tsukishima-onsen “ is located in tsukishima chūō-ku Tokyo where there are many Monjayaki restaurants. 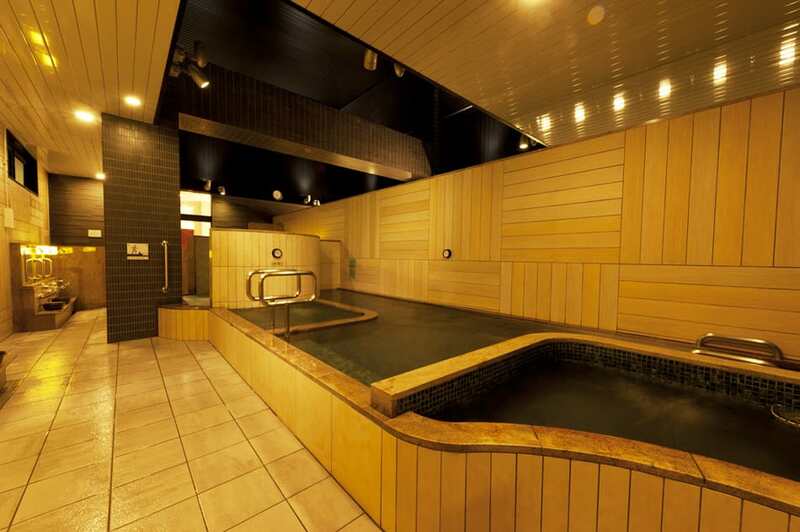 The name “tsukishima-onsen “ , you see ” onsen (hot spring )“. But it’s a sentō using a gentle soft water which is good for your skin. 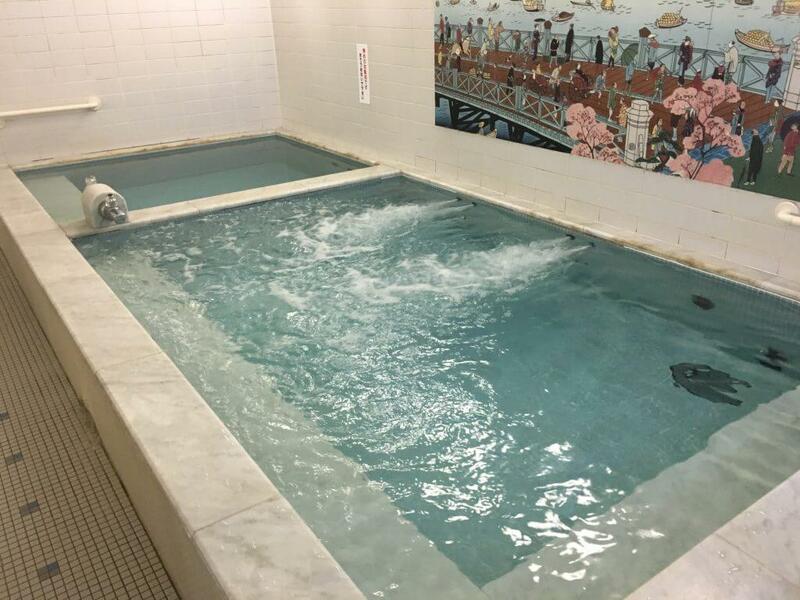 Besides a normal bath there are “Yakuto” (Bath filled with kanpo – traditional Chinese medicine) ”Mizuburo”(cold bath) and several others. There is also a “dry sauna”. When you want to take a sauna, you have to pay extra. The temperature of the bath is not so hot. There are no images on the wall. But it’s decorated by colorful tiles. Business Hours: weekday 14:30-23:45, Saturday & Sunday 12:00-23:45. No closing days.